Rachel Grimes Performs on the Caligari Piano at the KY Museum of Art and Craft January 18th | Louisville, Kentucky | Joe Hayden Real Estate Team - Your Real Estate Experts! Visitors to the Kentucky Museum of Art and Craft at 715 West Main Street on Museum Row in Louisville will not only have an opportunity to see amazing art, but also performances by the renowned composer and pianist Rachel Grimes as she interacts with art. Rachel will be performing a few of her original compositions as well as improvised pieces starting at 8 pm on Friday, January 18th on the authentic Caligari piano created by Wendell Castle. The Caligari piano in itself is a breathtaking work of dramatic art, but when combined with Rachel's ethereal compositions the art comes to life for an unforgettable experience. 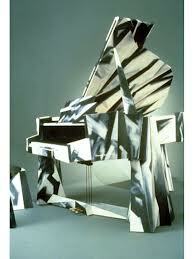 The Steinway piano is part of the Forms within Forms exhibit, but the performance is separate from the actual displays. The concert admission is only $10 for non-museum members with members admitted for $8. Standard admission does not gain admittence to the concert, but concert admission does provide entry to the remaining exhibits. Rachel's performance will be accompanied and complimented by a film projection created by Ryan Daly and inspired by Castles' creations. Watching the Caligari piano under the fingertips of a known master, Rachel Grimes, is a once-in-a-lifetime event that anyone with an ear for music will appreciate. To learn about other fun things to do, please visit JoeHaydenRealtor.com. Thanks Joe! Hope you can make it down to the museum to catch this performance.